We’d love your help. Let us know what’s wrong with this preview of Paris Ever After by K.S.R. Burns. Amy didn’t realize how stale her life was until she jetted off to Paris without telling a soul—not even her husband—and had the adventure of a lifetime. Now as she tries to establish herself in the City of Light, she finds that despite a fun (and quirky) group of friends and the ability to indulge in French pastri Can Amy’s rocky start in Paris turn into a happy ever after? To ask other readers questions about Paris Ever After, please sign up. I didn’t love the beginning of this novel, where the author is catching the reader up on what happened in book one, which I didn’t read, but once I got into it, I really enjoyed being transported to Paris and getting caught up in Amy’s dilemmas. Amy is pregnant and hasn’t spoken to her husband in months. She wants to tell him he’s going to be a father, but he’s still in Phoenix and won’t return her calls or emails. Though they fought, which is why she’s still in Paris, she thinks things can stil I didn’t love the beginning of this novel, where the author is catching the reader up on what happened in book one, which I didn’t read, but once I got into it, I really enjoyed being transported to Paris and getting caught up in Amy’s dilemmas. Amy is pregnant and hasn’t spoken to her husband in months. She wants to tell him he’s going to be a father, but he’s still in Phoenix and won’t return her calls or emails. Though they fought, which is why she’s still in Paris, she thinks things can still be repaired, especially since he’s going to be the father of a baby girl. Amy happens to have astonishing luck meeting people who go out of their way to help her, including by offering her room and board. It stretches the imagination, as does the fact Amy misreads a situation that you, the reader, will figure out well before she does. Still, I’d recommend this series to anyone who is going to spend anytime in France or would like to but can’t afford it. I’ve been to Paris, but I learned a lot about French customs that I didn’t know and wish I had known before I’d traveled there. I love Paris and reading about how Amy can pay out of pocket for prenatal care and giving birth even without insurance because health insurance is so much less expensive there is yet one more reason to be jealous of Parisian life. Amy Brodie jets off to Paris without telling a soul—not even her husband. Originally, it was only going to be for a couple days while her husband was out of town. But it turned into a longer stay than she had planned. She met a group of quirky friends while trying to find her way in the City of Light, who have taken her under their wing. She has been in Paris five months now, her tourist visa has expired, and it’s her 30th birthday and a party with her friends is in the works. On this very same day as her birthday her estranged husband, Will, shows up in Paris. Because she he has no idea whether he wants to reconcile or separate she avoids him for several days. On the day after her birthday, a young woman arrives on Amy‘s doorstep, unleashing chaos among her friends, and leaving Amy homeless. As Amy’s dreams begin to fall apart she doesn’t know which way to turn. Should she attempt to reconcile with Will and return to Phoenix Arizona, or should she continue to forge her way in Paris? 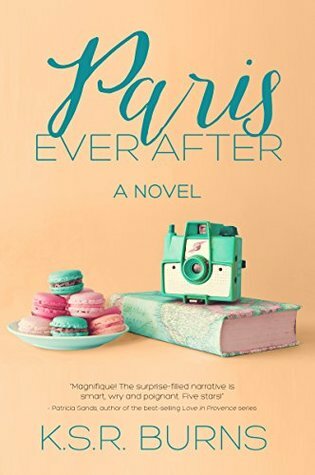 Paris Ever After is a cute and quirky story, set in a fabulous city complete with some terrific food references and Amy’s favorite Parisian Madeleine recipe. Amy’s character and her story left me wanting. Her decisions which propelled the narrative were somewhat irrational, and flying off to Paris without telling her husband is only the first! Perhaps, by not reading an earlier Burns book—The Paris Effect—I probably missed something about Amy’s mindset. I would definitely recommend reading The Paris Effect before Paris Ever After. The writing was good, but sometimes it felt like the story was an out of control car careening down a narrow Paris street, bouncing off one wall and then off the other. Sometimes that can be fun but I found there to be far to many coincidences happening to make Amy’s story seem realistic. Thanks to LibraryThing for a copy of this book in exchange for an honest review. FULL REVIEW WILL BE TOMORROW, JUNE 6. "The marvelous, sweet, delightful story line and descriptive writing style of Ms. Burns pulls you into the life style of the characters and into the French way of life. The descriptions of the scenery, bakeries, people, and food will have you wanting to immediately make plane reservations. I do want to say that I am still intrigued by the concept, by the idea for this story. I just believe it could've been executed better. Can you see where this is going? I struggled writing this review because I really don't want to bash the author at all but Paris Ever After simply wasn't my cup of tea at all. The entire story felt very repetitive when it comes to our MC's - Amy's - past. I felt like it was said over and over again how it came to be she's living in Paris. The overall story line was welcome, sure, but at one point it became ridiculous to have the reconfirmation of what had happened over and over again. Talking about Amy... She got on my nerves quite a lot. She's supposed to be 30, yet she's very egocentric and judge-y. She has this tendency of whining and being ridiculously naive to the point of me wanting to bash my head against a wall. You can easily have a character you don't like, but this time it totally ruined my reading experience at times and that's just... wrong. I couldn't connect with her at all and it's something I felt is needed when it comes to romance novels like this one. You want to be able to understand their actions, reactions and thoughts but I didn't. Usually when romance novels like this one are set in Paris, you can feel the Parisian magic ooze out of the story but in this case? The opposite was true. I didn't lose myself to its magic at all. Some descriptions almost pulled it off but they didn't enthrall me as I expected them to. Apart from that I also got annoyed by all the translations from French to English. I completely realize and accept that's due to my knowledge of French which made the translations absolutely unnecessary but I still couldn't help but get annoyed by it. Every French word was translated one way or another and it took away from my enjoyment. Again, I realize this is subjective and is totally my own fault. Then we have the ending of this novel. Everything felt way too convenient for my liking. Orchestrated, easy and unrealistic are the words to describe my thoughts about the entire novel when I finished reading. I saw every twist and turn coming - even the ones who shouldn't have been overly obvious. I can't remember reading any clear foreshadowing, but I wouldn't be surprised if there was, really. Amy has been staying in Paris for the past few months. After the death of her best friend, she had to fulfill their dream of going to Paris. The problem, she took off without saying anything to anyone, including her husband. When she returns home, he says he doesn't want to see her anymore, so she goes back to Paris. She makes new friends, finds a place to live and even finds a little job to keep her busy. But as she is gathering items for her birthday celebration, she sees her husband in Paris. Amy has been staying in Paris for the past few months. After the death of her best friend, she had to fulfill their dream of going to Paris. The problem, she took off without saying anything to anyone, including her husband. When she returns home, he says he doesn't want to see her anymore, so she goes back to Paris. She makes new friends, finds a place to live and even finds a little job to keep her busy. But as she is gathering items for her birthday celebration, she sees her husband in Paris. What is he doing here? Why didn't he tell her he was coming? Why hasn't he replied to any of her texts or phone calls? And why does he look like that? Over the few days he is in Paris, Amy's life will change dramatically. Will she return to the States with him, or will she stay in Paris, ever after? Thank you to KSR Burns for a copy of this book and the opportunity to read and review it. When I first started reading this book, I was sure I was going to love it. Amy and I share the same birthday so I was bound to connect to her. But for me the story fell flat. There were good parts to it, like learning more about Paris and the sights there. Some of the plot seemed a bit far-fetched. I can't say too much without giving away the story. I did read the book from cover to cover though and it didn't make me want to stop reading it, which is why I gave it 3 stars. I think other readers may enjoy this story more than I did. If you like Paris and are familiar with French, maybe this will speak to you better than it did me. Sometimes I find that books with a lot of foreign phrases that aren't translated are difficult. This book did explain the phrases a lot, but their were parts that left me confused. Maybe because this is a sequel the story fell flat for me, I' not sure. I will read other books by KSR Burns. In fact, I'm going to go back and read this first book to see if that helps. I felt the same way about the Me Before You series. I had to read the whole thing to enjoy each individual book. Amy goes to Paris, leaving a husband behind without saying a word. The ability and ease with which she did this took my breath away. Can one just walk away from a husband, home, job, and just jet off to Paris to "find oneself". Anyway Amy does just that. She lands on her feet, finds a beautiful woman who takes her into her home and heart, links up with her friends and has now made a life for herself. She also did not realize when she left Will her husband that she was pregnant. Now she is well a Amy goes to Paris, leaving a husband behind without saying a word. The ability and ease with which she did this took my breath away. Can one just walk away from a husband, home, job, and just jet off to Paris to "find oneself". Anyway Amy does just that. She lands on her feet, finds a beautiful woman who takes her into her home and heart, links up with her friends and has now made a life for herself. She also did not realize when she left Will her husband that she was pregnant. Now she is well advanced in her pregnancy, still not sure what she is going to do, ambivalent about her feelings towards Will and Manu (whom she found in Paris!) protective of her unborn child and basically not sure of anything. Please note that I received this book via NetGalley. This did not affect my review or rating. Please note that I did not read the first book in this series, "The Paris Effect." I really loved the cover. Honestly the cover is what made me request this book. Also it's about Paris. I dream of traveling there and eating all the cheese and pastries I can stand. And yet this book made Paris boring. It made Paris an afterthought. I didn't even know that was possible, yet here we are. We have an unlikabl Please note that I received this book via NetGalley. This did not affect my review or rating. I really loved the cover. Honestly the cover is what made me request this book. Also it's about Paris. I dream of traveling there and eating all the cheese and pastries I can stand. And yet this book made Paris boring. It made Paris an afterthought. I didn't even know that was possible, yet here we are. We have an unlikable main character (Amy) who through ridiculous happenstance manages to come out of the end of this book with a perfect life. It just didn't feel realistic to me at all. The secondary characters were not developed at all (we have Amy's landlord Margaret, her boss/friend Manu, and a random stranger who has befriended them from the last book named Hevre). The writing was not working for me at all. Probably because every five seconds Amy is telling you she has to eat something. And mostly it seems to be cheese and chocolate. I don't know, I just found the whole book boring. "Paris Ever After" follows Amy as she settles into her new life in Paris. Burns gives readers a quick rundown of Amy's life prior to this book, her best friend died, she fled to Paris without telling her husband (his name is Will) and then Will said they were done and she fled back to Paris. Amy is sort of working (she never seems to show up there) for her friend Manu and also I think runs a blog (it's a throwaway line) and mostly spends most of this book trying to work out what to do when her estranged husband comes to Paris looking to meet up with her and a young woman who has ties to Manu and Margaret also appears. I found Amy childish to the extreme in this book. She is about to turn 30 (and eventually does during the timeline of this book) but acts like she's 3. Will shows up in Paris, but she spends most of the time either hiding from her (she wants him to make an effort to talk to her) and then following him around Paris without him seeing her. I wish I was joking. She acts entitled and doesn't even seem to get the part she has played in their marriage falling apart. I wish that I could say that I at least had sympathy for Will, but nope, he's a jerk in a whole other way. I just find it hard to read books when I don't have anyone to root for. And when you have an unlikable main character you start to wonder why you are even bothering. Unless I am reading a "Gone Girl" type book, I want my romance novels to actually have a heroine I don't want to throttle. The other characters read as stereotypical French people. Hevre acts spoiled (he's a Baron) though you have to be pretty obtuse to not pick up on the fact that something that way doesn't pass the smell test. I didn't care an iota about Manu. He was just there. Margaret got on my nerves and what Burns did with her character didn't make a whole lot of sense to me. I just chalked it up to plot reasons and let it go. The writing didn't work at all. The book felt like it was scrambling to me to have something interesting to say. Amy barely does a thing besides traipse from scene to scene with people falling all over themselves letting her stay with them. If that's true I need to go to Paris as quick as possible. The flow didn't work either. You have an overall plot with Amy and Will, but there are two other side plots happening in this book and it takes until the very end to wrap those up as well as Amy and Will. The book takes place in Paris though Paris barely feels alive in this book. We do have a scene where Amy takes Will around Paris and that is about it. I still didn't get a great sense of Paris or why Amy is so happy living there (besides the fact she managed to just live rent free with people and have everyone concerned about her well-being at all times). Following on from the first book in this series (The Paris Effect) we are thrown back into the crazy world of Amy and her new life in Paris. While PARIS EVER AFTER by K.S.R. Burns can be read as a standalone novel, I recommend that you read the books in order as it will give you a greater understanding of Amy and what drives her. As Amy's birthday approaches there have been a lot of changes in her life but none as big as what is happening to her now. And when her estranged husband, Will, suddenl Following on from the first book in this series (The Paris Effect) we are thrown back into the crazy world of Amy and her new life in Paris. While PARIS EVER AFTER by K.S.R. Burns can be read as a standalone novel, I recommend that you read the books in order as it will give you a greater understanding of Amy and what drives her. As Amy's birthday approaches there have been a lot of changes in her life but none as big as what is happening to her now. And when her estranged husband, Will, suddenly reappears in Paris and a young woman lands on her doorstep, everything that Amy had planned is even more up in the air. Amongst the beauty and magic of Paris, can Amy untangle the secrets and her own emotions enough to find the life that she truly wants or will her french dreams fall to ruins around her? Enjoyable and a little crazy is the best way to describe Amy and PARIS EVER AFTER by K.S.R. Burns but with the sounds and sights of stunning Paris coming alive on every page, plenty of drama and secrets, you certainly won't be bored and it is well worth a read. After half-heartedly speed-reading through the very repetitive first half of this sequel to The Paris Effect, I began to enjoy the second half as much as I am able to enjoy any Hallmark Channel movie as it was entirely predictable, one-dimensional, way to convenient, and abruptly ending with a kiss. I didn’t need to read the first book to “get” the sequel. I’m pretty sure that the first half of Paris Ever After could have been entirely removed and the second half the conclusion to the original b After half-heartedly speed-reading through the very repetitive first half of this sequel to The Paris Effect, I began to enjoy the second half as much as I am able to enjoy any Hallmark Channel movie as it was entirely predictable, one-dimensional, way to convenient, and abruptly ending with a kiss. I didn’t need to read the first book to “get” the sequel. I’m pretty sure that the first half of Paris Ever After could have been entirely removed and the second half the conclusion to the original book. The scarf, pure double-ply silk, glows invitingly. I pluck it out, shake it open, hold it up, and sigh. Exquisite. Perfectly square. A hand-rolled and hand-stitched hem. Signed by the artist. Probably cost at least three hundred euros. I admire its beauty. Then I use it to blow my nose. Let’s face it, revenge really is best served cold. The above is an honest review of an advanced copy provided by the publisher via NetGalley. After reading The Paris Effect some time ago, I was pleased to hear there would be a sequel. I was eager to read Paris Ever After and catch up with Amy to see what had been happening since we last left her. The book opens with a little taster of where we left off on the last book just incase all had been forgotten. Once again we are treated to the delights of Paris, with vivid descriptions of the food, buildings, gardens and culture of Paris, we are lost and transported right back into the life Am After reading The Paris Effect some time ago, I was pleased to hear there would be a sequel. Once again we are treated to the delights of Paris, with vivid descriptions of the food, buildings, gardens and culture of Paris, we are lost and transported right back into the life Amy has now created for herself. But life may not be that simple, Amy is now pregnant and when estranged husband Will turns up out of the blue, Amy needs to decide what she is going to do. Amy is still living with Margaret, but when her lost daughter Sophie turns up and takes an instant dislike to Amy, her life and plans are put into jeopardy. Once again I didnt want to put the book down and was eager to turn to the next page. A perfect read for when you want to get lost and escape to a different country. Can Amy’s rocky start in Paris turn into a happy ever after? Amy didn’t realize how stale her life was until she jetted off to Paris without telling a soul—not even her husband—and had the adventure of a lifetime. Now as she tries to establish herself in the City of Light, she finds that despite a fun (and quirky) group of friends and the ability to indulge in French pastries whenever she wants, reinventing her life is much harder than she imagined. Then on Amy’s thirtieth birthday, two unexpecte Can Amy’s rocky start in Paris turn into a happy ever after? Amy didn’t realize how stale her life was until she jetted off to Paris without telling a soul—not even her husband—and had the adventure of a lifetime. Now as she tries to establish herself in the City of Light, she finds that despite a fun (and quirky) group of friends and the ability to indulge in French pastries whenever she wants, reinventing her life is much harder than she imagined. My Thoughts: In our first look at Amy Brodie in Paris Ever After, she is still reeling from the death of her best friend Kat. The death that sent her flying off to Paris on a trip that she and Kat had planned, but was derailed by her death. But then, after just a few weeks, Amy returned to Phoenix…to a bitter fight with William that catapulted her back to Paris. On her second day, she meets an older woman named Margaret, who offers a room, and in a short time she begins to feel at home. Her life is now full of beautiful café lunches; soirees at Margaret’s, with her two friends Herve and Nanu; and a new pregnancy with baby daughter Catherine. Just before she left Phoenix that last time, William gave her a parting gift. He does not know, however, and now she faces a dilemma. Can she share her news with him and see if there is anything left of the marriage? What will her future hold: Paris or Phoenix? A lovely book full of scenes that I loved, some characters that were wonderful, and others that were not. Secrets come out and an unexpected reunion between Margaret and someone she thought she had lost would upend Amy’s plans. Where will she belong now? As the story drew to an end, I was hoping for a sequel so that I could spend more time with these characters. 5 stars. I really enjoyed this adventurous frolic through the streets and tunnels of Paris... and fell for the setting first and then the characters. I adore reading about Paris and love the way the French language is interspersed eloquently throughout Paris Ever After. Author, KSR Burns does a splendid job of introducing the reader to Amy- she's a hot American pregnant mess who has somehow made friends with the neatest characters. You know- the people we would love to have as our own friends in a far aw I really enjoyed this adventurous frolic through the streets and tunnels of Paris... and fell for the setting first and then the characters. I adore reading about Paris and love the way the French language is interspersed eloquently throughout Paris Ever After. Author, KSR Burns does a splendid job of introducing the reader to Amy- she's a hot American pregnant mess who has somehow made friends with the neatest characters. You know- the people we would love to have as our own friends in a far away land. The characters themselves are quirky, fun, complicated, and most importantly interesting! Each character seems to have their own story waiting to be shared. Things seem to be settling into a fun and easy routine for Amy and her new friends Marguerite and Manu when two people show up into her world unannounced. Enter her estranged husband, Will and Marguerite's long lost daughter Sophia. Sophia brings in chaos and Will has news to share with Amy.... Amy also has news to share too and is bursting to tell him that they are now expecting a little girl she has already named Catherine. I felt this book was really well written. I was intrigued with the scenes, the food, the stories, and the characters... not necessarily in that order. I like the way Amy works through her grief in missing her best friend Kat. I wanted her to really give Will a hard time in this book, but feel that she handled herself pretty well given the situation. Overall, a fun and adventurous route to an ever after that takes the reader on a tour through parts of Paris that the everyday tourist does not get to encounter with big surprises along the way!!!! Amy's best friend died, she left Phoenix to go to Paris for a few days without telling her husband William, who got mad and told her to go to hell. Currently, she's 5 months pregnant (with her husband), living in Paris with an old lady, whose daughter had disappeared but now have reappeared and is kicking Amy out of the apartment. William comes to Paris with unknown intentions. This was a quick and relatively fun read. I didn't care for most of the characters. Amy was naïve and submissive but it was bearable most of the time. She had a giggle about the fact that for one character (a creepy French guy), feminism is a "serious affront". But she was also kind of funny and passionate about things at times, which saved her from being boring. The constant confusion Amy went through about the weirdness of the French characters worked well for me as a Czech reader as well. I have a feeling they were supposed to be quirky but they were more like just unlikable for me. Her American husband was a total jerk (abusive, misogynistic, homophobic etc.) and it made Amy look stupid for marrying him in the first place. We didn't learn much about the new love interest. The development of the romance between those two was believable but unfortunately, it wasn't shown (in this volume, at least). Although the characters made me think "oh yeah, I really wouldn't want to move to France", the descriptions of the city and food were quite satisfactory. Overall, it was fine, although it would probably be better enjoyed by people who adore anything French. I read the first book in the series, and although I loved Burns's writing style, the quirks in the plot, and her masterful description of Paris - (seriously. I live in France and I still learned things about Paris and appreciated its beauty through her writing in ways I had not before) - I didn't love the ending of that first book, which left a major thread hanging when I prefer everything to be tied in a neat little bow. That's just a personal preference, wholly unrelated to the book's worth. Ho I read the first book in the series, and although I loved Burns's writing style, the quirks in the plot, and her masterful description of Paris - (seriously. I live in France and I still learned things about Paris and appreciated its beauty through her writing in ways I had not before) - I didn't love the ending of that first book, which left a major thread hanging when I prefer everything to be tied in a neat little bow. That's just a personal preference, wholly unrelated to the book's worth. However, with Paris Ever After, I couldn't find a single flaw. Not only did I get to enjoy her beautiful, descriptive writing about Paris, I was swept up into a plot that was fantastic but still believable. I stayed up late to see what would happen next and regretted when I reached the last page. And I got my happy ending! I will be recommending this book to all my friends. Magnifique! Fall in love with Amy as she stumbles through her new life in Paris, gradually learning what means the most in her unscripted world. Burns' dry sense of humor and intimate knowledge of Parisian life are woven through the story as perfectly as the Hermès scarf in one of the book's most unforgettable scenes. Heartwarming and full of colorful characters, the surprise-filled narrative is smart, wry and poignant. You won't want to put it down. Five stars! This is a tale of love found, lost…and found again? Amy’s got a lot going on—homes on two continents, a marriage on the rocks, and friends who may not be what they seem. K.S.R. Burns does a masterful job of drawing us into Amy’s world as she lurches from crisis to crisis. I had a hard time putting the book down because I kept wanting to know what happened next. And talk about surprises! This book is full of them. Paris Ever After is a well-written novel with a fast-paced plot and a colorful cast o This is a tale of love found, lost…and found again? Paris Ever After is a well-written novel with a fast-paced plot and a colorful cast of characters. One of those characters is Paris itself and Burns draws a loving portrait of this most beautiful of cities. As you turn the pages, you’ll find yourself longing to nibble on a buttery croissant at a café near Notre Dame, or maybe take a stroll along the banks of the Seine. And don’t forget the hot chocolate! What path will Amy ultimately choose? Read this book and find out! It has been a few years since I read book one, The Paris Effect, where the likable, but rather screwed up Amy takes a life-changing trip to Paris, but I remember clearly that I found certain parts of it, and some of the characters, slightly disturbing. However, it was a real page-turner that kept my mind on full alert, as things aren’t always what they first appear to be. I was delighted to have the chance to return and see where Amy was now. The Amy we find in Paris Ever After at first appears t It has been a few years since I read book one, The Paris Effect, where the likable, but rather screwed up Amy takes a life-changing trip to Paris, but I remember clearly that I found certain parts of it, and some of the characters, slightly disturbing. However, it was a real page-turner that kept my mind on full alert, as things aren’t always what they first appear to be. I was delighted to have the chance to return and see where Amy was now. The Amy we find in Paris Ever After at first appears to be happier, more in control, and with a good reason to see her future with more positivity than I dared hope. Margaret, the friendly face who took Amy under her wing on her first visit to Paris, seems to be even more involved in Amy’s life now, but is showing a fragility that means theirs has become a mutual looking-out-for-each-other relationship. However, it doesn’t take long for events to upset their equilibrium and it is the unexpected visitors who provide the main plot this time. Amy certainly seems to have a knack of finding herself in somewhat bizarre situations alongside a real mixed (and often mixed up) set of friends. As well as the unexpected guests there are their unusual stories to take in too, and at times it seems uncertain if there is a place for Amy either in Paris or back in Phoenix. With lots of plot twists that seem to turn her life upside down, Amy eventually finds the focus she desperately needs, which gives her the ability to take control and decide where she will make her future, and who will be alongside her. I certainly felt much happier for Amy at the end of this book than I had at the end of the first. I'm a sucker for any book set in Paris! Paris Ever After is a perfect choice for fellow Francophile women's fiction fans (alliteration is fun!). Paris is a city almost every girl wants to live in at some point. So, who wouldn't want to run-away to the "City of Lights" from a rocky marriage and heartache in Arizona? This K.S.R Burns' novel was hard to put down at night, I was immediately drawn into Amy's story. Paris Ever After is a great read, perfect for your summer reading list! Paris Ever After is a sequel of The Paris Effect, but it can be read as a standalone. I have to be honest though, I think reading the first book is necessary to actually understand the story. You basically get thrown into the story, knowing little and learning about the characters and their past through the plot. However, in my opinion it would have helped to know these things beforehand. We follow Amy, who is actually from Phoenix, but currently lives in Paris. She is married to Will, but she tries to avoid him and she has built a life in Paris now. Things get more complicated, when he shows up and tries to find her. She is carrying around a little secret as well and she meets different kind of people in Paris. They become part of her life. She has to make a decision though; about what she really wants. The storyline was a bit of a mess. I felt it was jumping around a lot and at times there were too many things going on. I really enjoyed the little snippets of Paris, but unfortunately the spark didn’t fly for me. Paris Ever After is a fun and at times emotional read. Amy is definitely one I could relate with. KSR Burns did a fabulous job making Amy a true to life character. I felt like I knew her and understood her life. Of course, I would love to go off to Paris for awhile! I am glad I was able to see the city through her eyes. The author’s talent shines by describing the details of the setting, making a reader feel as though they were part of the story. Amy goes on quite the adventure that she would ha Paris Ever After is a fun and at times emotional read. Amy is definitely one I could relate with. KSR Burns did a fabulous job making Amy a true to life character. I felt like I knew her and understood her life. Of course, I would love to go off to Paris for awhile! I am glad I was able to see the city through her eyes. The author’s talent shines by describing the details of the setting, making a reader feel as though they were part of the story. Amy goes on quite the adventure that she would have never expected. Will this lead to a new life and perspective for Amy? There was in no way could I have predicted how it would have ended for her. I give Paris Ever After 4 1/2 stars and look for more by this author in the future. I recommend this book for those who love good contemporary fiction. Paris Ever After picks up after the end of the Paris Effect, but the previous book does not need to be read in order to enjoy this book. They can both be read as a standalone. After the death of her best-friend, Amy had made some rash decisions which ended with her being estranged from her husband and living in Paris. She was basically in limbo but getting by with the help her friends. Being in Paris had been a dream come true for Amy but with all good things, they never se True rating 3.5 stars! Paris Ever After picks up after the end of the Paris Effect, but the previous book does not need to be read in order to enjoy this book. They can both be read as a standalone. After the death of her best-friend, Amy had made some rash decisions which ended with her being estranged from her husband and living in Paris. She was basically in limbo but getting by with the help her friends. Being in Paris had been a dream come true for Amy but with all good things, they never seem to stay the same. While in Paris, Amy discovers an unexpected surprise that has changed her outlook on life and forces her to consider her situation in a different light. Not only is there an unexpected surprise for her but also for her very dear friend as well. Unfortunately for Amy though, her friend’s surprise interrupts the fragile foundation that has tethered Amy to Paris. When she finds that her husband has come to Paris in what looks like an attempt of reconciliation, Amy starts to consider just what she has to stay in Paris for. I feel like the Author did a great job explaining the circumstances that brought Amy to Paris. Despite her best friend Kat not being a true character, her presence was very much felt. I did feel like Amy was a bit wimpy when she realized her husband had come to town. She chose to evade him far longer than I felt was necessary. I also would have liked more characterization of Amy’s husband. Was I supposed to feel anything for him? Despite that, I feel like Amy was a true to life character that many could relate to and that her time in Paris had both its serious moments as well as its humorous ones. The ending was quite tidy but it was a cute ending that would satisfy many readers. This review is based on a complimentary book I received from Author, K.S.R. Burns. It is an honest and voluntary review. The complimentary receipt of it in no way affected my review or rating. As a Francophile, I am partial to books with a Paris setting. I enjoyed this romp around Paris with Amy, a woman from Phoenix, Arizona who fled to Paris after the death of her best friend, leaving behind a troubled marriage. With some unusual characters, like Margaret, a woman who treats Amy like a daughter, Manu and Herve, the novel follows Amy’s personal growth. I liked it. This was a jam-packed little novel from K.S.R. Burns. She takes us on a magical journey through Paris, and on a wild ride of a story line for Amy, the main character. I found myself devouring this book in a very short amount of time. I wasn’t disappointed with the ending and appreciated the fact that there is a happy ending. This is apparently the second book about Amy, but I don’t feel it is necessary to read it before picking up this one. There is enough of a backstory shared with the reader t This was a jam-packed little novel from K.S.R. Burns. She takes us on a magical journey through Paris, and on a wild ride of a story line for Amy, the main character. I found myself devouring this book in a very short amount of time. I wasn’t disappointed with the ending and appreciated the fact that there is a happy ending. This is apparently the second book about Amy, but I don’t feel it is necessary to read it before picking up this one. There is enough of a backstory shared with the reader to keep you up to date and aware of what is going on in Amy’s life. We find Amy in Paris, fulfilling her dream that she shared with her best friend, Catherine, who is no longer with her. The two had this trip planned for a long time. Unfortunately, Catherine isn’t able to see this dream come to fruition, as she has recently lost her battle with cancer. When Amy’s marriage becomes a bit rocky she takes the opportunity to pack things up and go to Paris. K.S.R. Burns does a wonderful job of bringing to life the wanderlust of the city of Paris. From the descriptions of the places that Amy visits to the food that is consumed and made, you feel as if you are there experiencing the city along with Amy. Things go well for Amy at first. She manages to find a place to live in Margaret’s home. Margaret has a daughter, Sophie that is missing and has been for two years so she has the room to spare and the desire to help a young woman that is in need. That is until Sophie shows up and demands her place in her home back. This is just one obstacle that Amy is faced with overcoming. The other obstacle is Amy’s estranged marriage to husband Will. She hasn’t told him that she is carrying his child and isn’t sure how to break the news to him. Suddenly though he thrusts himself back into her life when he shows up in Paris. He isn’t necessarily there to reconcile though and has a big secret of his own. I wasn’t a huge fan of Will though I did see where the need for a protagonist is necessary in this novel. Where will Amy go from here? She has found herself in some complicated and difficult situations. She has a baby cooking by her ex, and he has someone new that promises to disrupt any chances they have of making their marriage work. Will Amy return home in the states or decide to stay in Paris and make a life for herself and her daughter? There is a love interest for her that promises to make the book that much better and add a twist that one didn’t see coming. Will she end up getting her happily ever after? I can honestly say that this being my first read of K.S.R. Burns I was pleasantly surprised with all the action that was packed into a concise and short novel. I found myself breezing through it and wanting more. I will definitely go back, even though it isn’t necessary, and read the first book to have the extra background of the story. I found this the perfect escape read for an afternoon in the sun. This is a review of an audio edition of the book. There is no audio edition on GR. A woman who leaves a husband she only married because it was important for the moment and then when the moment passed there was no common ground. After she takes off for France they both move on. It’s interesting, and Amy knows it, that her lack of unhappiness at the separation, and her halfhearted attempts to gets not a harbinger in touch with him, is not a harbinger of good news for her relationship. When she sees Will, turned up by surprise, and goes on to her birthday party; when she finds the unexpected girl mentioned in the blurb far more upsetting than her spouse showing up the reader should realize there’s not much holding the couple together. Her professed willingness to go back with him to Phoenix (of which she speaks with about as much affection as one would for cleaning toilets), is also halfhearted. The arrival of a young woman on her doorstep, referenced above, is a wrench in her safe position, her plan b. These two events happening within twenty-four hours represent the crossroads of her life, both push her off being able to stay in a harbor where she has no need to make a decision. I did not believe the friends she’s found in France as characters: they are all too much – over the top. caricatures. Too many parents and friends have died to make this story. Amy is like flotsam and jetsam on the wave of tumultuous change, only directed by a new priority and new feelings. Most of what happens to her is chance, good fortune mostly. This story is one that takes place in Paris because sometimes it is legendarily a a place of second-chances, amazing occurrences and new beginnings. Could it take place elsewhere – is Paris intrinsic in the algorithm of change that occurs in Amy’s world? I don’t know. But, Paris seems to be a kind of authorial shorthand for this. Elise Arsenault is new to me as a narrator. I only have a little French so whether her French pronunciation is fabulous I cannot say, but her emotional expression is spot on and she has not overacted. This review has been hidden because it contains spoilers. To view it, click here. In all honesty, I disliked & liked Paris Ever After. I will tell you I have not yet read Paris Effect & I could be missing crucial pieces of the puzzle. I may go back to read the first book in search of those details that could change my opinion but until then I can only go by what I know. How could Amy find out she's pregnant by her husband, that she ran out on, and not try harder to let him know? I get he was hurt or angry or both that she left & told her to go & not c In all honesty, I disliked & liked Paris Ever After. I will tell you I have not yet read Paris Effect & I could be missing crucial pieces of the puzzle. I may go back to read the first book in search of those details that could change my opinion but until then I can only go by what I know. How could Amy find out she's pregnant by her husband, that she ran out on, and not try harder to let him know? I get he was hurt or angry or both that she left & told her to go & not come back but this is bigger than that. I thought it was selfish of her. When Amy sees that William has traveled to Paris, OF COURSE TO FIND HER, how could she not immediately contact him? She has monumental information. That should have been her priority. I knew immediately when she described the visual changes in William & then his selfies that he DIDN'T send to her, that there was someone else. How could she not? Especially after she'd been gone for months & didn't look like she was ever coming back? Ever think that there wouldn't be someone else if she would have done better in letting him know she was pregnant? I understand changes in these facts would mean the rest of the story essentially wouldn't exist but these are the things that made me angry with Amy. And William? He should have told Amy immediately his reasons for being in Paris, not led Amy on & then sleep with her. GAH!! It takes two to tango but as a woman, I know, that wouldn't have happened if Amy had known his true intentions for being there. How could William turn his back on his daughter if he was so 'family oriented' as he was described as being? My heart hurts from so many scenes. This is a book hangover I may not get over very soon. Even though so many situations made me want to scream, I had to keep reading to see what happened, how it all worked out. I found the support characters interesting, as well as their stories that intertwined with Amy's. I'm glad Amy got her HEA. Amy turns 30 in Paris, doesn't that sound wonderful. It is. Amy ran away to Paris and met the most wonderful woman who took her in like Amy was her daughter. She found a job that she enjoyed, friends that she wanted to spend time with, and then she found out she was pregnant. She tried to tell her estranged husband but he refused to answer any of her attempts. Then she sees him, at the hotel she had stayed at, and she wonders what he wants and if he came to get her, to win her back over. Amy is Amy turns 30 in Paris, doesn't that sound wonderful. It is. Amy ran away to Paris and met the most wonderful woman who took her in like Amy was her daughter. She found a job that she enjoyed, friends that she wanted to spend time with, and then she found out she was pregnant. She tried to tell her estranged husband but he refused to answer any of her attempts. Then she sees him, at the hotel she had stayed at, and she wonders what he wants and if he came to get her, to win her back over. Amy is a strong character and was able to take what was thrown at her without really losing a step. There were a few twists that I wondered if her reaction was realistic. The fact that her husband shows up, finds out she is pregnant, and then proceeds to just spend time with her without having an important conversation seemed off to me but Amy just went on with life. Maybe more of us should be that easy going but I do believe most people would question their husband about their intentions. There were a few other happenings that made me go HMM... is that real. The setting of Paris is one of my favorites. I love hearing about the sites, the great cafes, the beautiful cathedrals, and the wonderful sounds of Paris. Every time I read a book in this setting I hope that it takes me to a place that I haven't been and someday hope to visit. K.S.R. Burns is talented with her words and is able to transport her readers to a wonderful city. There are a few side stories, a friend now being who they seem and a stranger showing up and pushing Amy out of her comfort area, that kept the story interesting. I liked that they added an additional twist to a story that seemed to be heading down the path I expected it to. Writing as Karen Burns, she is also the author of THE AMAZING ADVENTURES OF WORKING GIRL: Real-Life Career Advice You Can Actually Use (Running Press 2009).